As Melany mentioned in our last blog, with the fall comes the work. We both are trying to juggle kids, school, home and work. It is hard to find to time to sew (and blog!) and projects to tackle. Usually, when we just need to get some sewing time in we turn to one of our favorite and easy projects. 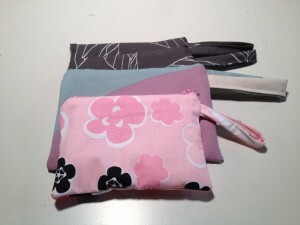 This time we made a bunch of zippered purses. These cute, practical purses are perfect for make-up or to use as a wallet. They are also easy and fast to make, and therefore, very satisfying. 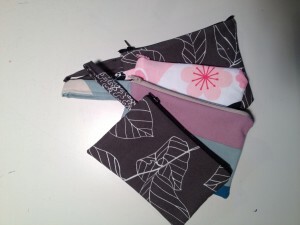 We will have these cute zippy’s on sale at the Lewis and Clark Middle School craft fair, Saturday, October 20. We sell them for about $8 to $10 depending on the size and the fabric.